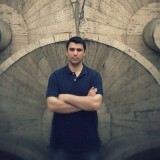 Darbinyan is an electronic music producer from Yerevan, Armenia. Being deeply passionate about diverse styles of music since early childhood, he started to create his own sound since 2006.His first attempts were made in house and techno, but the most serious step was the remix of Chymera, “The Fathoms” released on Connaisseur Recordings. It got many feedbacks from such well-known DJs and producers as Peter Kruder,Mijk Van Dijk,Harry Avers and more. Much is being done right away and there is more to come!